Other Gardens - Lost and Found! Ralph, and later with Bramley, designed and made hundred's of gardens. Many are well known and are explored on other pages within this website. Other 'domestic' gardens are quite possibly lost forever, their whereabouts unknown. Unfortunately, for latter day garden hunters, Ralph's 'When I Make A Garden' gives very little help in locating these missing gems. Most images are not annotated or are simply Show Gardens from Chelsea or elsewhere. Some of the following gardens have been rediscovered, their exact whereabouts are now known. But, others are yet to been found. Three recent discoveries have been added here. Others are being verified and will be added shortly. Thanks to William Bartlett PhD, a local Ridgewood resident and NBC Staff Historian. We now have confirmation of another lost Hancock garden. Retail magnate, JJ Newberry - owner of the five-and-dime chain of stores - built 95 Wildwood Road in 1929. The beautiful Normandy Tudor style home is made of brick, granite and limestone and also features oak timbers to give it that old-world look. It is very typical of the time and representative of the grand Tudor homes and universities built during the period. Although modernised with up to date equipment and features, the massive property still retains large impressive rooms with high ceilings and leaded windows. It also retains many of the features from when Newberry had it constructed such as polished wooden floors and beautiful wood panelling. A Tudor style fireplace can be found in one of the larger rooms as well as a feature staircase in the hall. The feature staircase and beautiful wood floors. Situated on over one acre of private property in the 'Heights' Section of Ridgewood, the house comes with a lovely mature garden. It is very likely that Ralph constructed the gardens soon after the main house was constructed and not too long after he arrived in the United States. Hancock’s own home was only a few miles away in Montclair, New Jersey. As readers can see from the two images of the house above. One taken from the 1935 edition of Hancocks publication, When I Make a Garden and the other a recent (2018) photograph. There is no doubt that the two property’s are one in the same. The modern image of the front of the house shows what were mere saplings in the early 1930’s are now mature specimens. The path leading up to the front door is typical Hancock in design as are the paths and stone constructions at the rear and side of the house. It is difficult to see from the modern photographs whether any of the planting is by Ralph. As nearly 90 years has passed since the gardens were originally laid out, one can only imagine that very few of the living things he planted still exist? It is also not too clear from the images, whether the wrought iron work seen at the side and rear of the house is from Ralph’s own workshop. But, the style is again very typical Hancock in look and it would have been very unlikely that Ralph wouldn’t have offered his wealthy client the full package. As of December 2018, the house was up for sale with a conservative estimate of $1.79 million. This garden, less than a mile from the former Hancock home at Gate House Farm, has recently been painstakingly restored by its current owner. The herringbone brickwork and pathways were in a poor condition and have been relaid. The sundial, seen here, remains in its current position although it has been re-set. The tree cut into an interesting topiary design is now mature and full. This image of the house and garden is the only colour photograph from When I make a garden - 1950 edition. The three images, taken from 'When I Make a Garden' are of the same garden photographed in the village of Swinbrook in Oxfordshire. Shown here is the garden with a magnificent view of 17th century, St Mary the Virgin Church, Swinbrook. Novelist Nancy Mitford is buried within the churchyard. Another view of the garden. Ralph didn't have to travel far to find the Cotswold stone for use within the dry stone walls used within this garden. And, again here we can see the trademark Cotswold stone walls and naturalistic planting that make this garden look like nature itself just took hold. St. Quentin's House was bought at an auction by brothers Francis and Ronald Walters in 1947, on the death of its previous owner, Blanche Homfray. It was probably shortly after this, the garden belonging to the cottage, which was previously the stables for the larger house, was redesigned by Ralph Hancock. It was constructed using Westmoreland stone, he created a series of rockeries and pools which cascade down the side of the hill to an ornamental pond at the foot of the garden. Stone paths run between the flower gardens, lawns and shrubs. Low stone walls and Ralph's familiar herringbone brick walkways are evident throughout the garden. An Italianate fishpond complete with a fountain strikes a classical note at the foot of wide stone steps, enhanced by a number of stone statues. The original box borders around the sundial have long gone but some of the topiary remains. The trees have now matured. A fine example of this is a tall Gingko overhanging one of the larger ponds. The character of the garden is still clearly recognisable. The stonework, although aged with time, still maintains the structure and vistas of Ralph’s design. Although the formality of some areas of the garden have blurred over the last seventy years, the essence has been preserved and may now be appreciated as a more romantic setting for its sunlit terraces, shady pools and arched walkways. N.B. This private garden is not open to the public. A recent private visit to these stunning gardens was arranged by Joyce Hunt. Her late grandmother was housekeeper at another property, Twyn-yr-Hydd in Margam that also boasts a spectacular garden designed by Ralph Hancock, post-World War Two. Joyce reported that the garden still maintains many of the original features. A stone bridge. A formal pond. A wrought iron gate. A beautiful sundial and pathways that would be familiar to any admirer of Ralph’s work. She also noted that a once lively cascade had, unfortunately, become overgrown. The current owner of the property also explained that some other features and stonework had been moved about since Ralph installed them. The following pictures, taken during her visit, give us a glimpse of Ralph’s enduring designs. Left: The formal pond with a fountain feature. This style of pond has been seen in other gardens which Ralph designed and was used to great effect at The Chelsea Flower Show. This charming sundial, seen right, has a barley twist column and sits on a sunburst effect path made from the Tudor style bricks found in many of Ralph’s gardens, most notably it was a feature found at Derry Gardens. The rooftop garden which Ralph created for Trevor Bowen of the Derry and Toms Department store in London’s fashionable Kensington. The sundial too could once also be found in the Tudor Garden atop the department store. Sadly, those features were lost many years ago. And, since January 2018, the once popular Kensington Roof Gardens have been shut to public view. The image, left is of the little stone bridge that straddles the now overgrown cascading water feature. An example of this feature was restored recently at Ralph’s former country home, Gatehouse Farm, near Lingfield. The bridge is similar in design to other bridges that can be found at a Twyn-yr-Hydd, Margam and at The Hyning in Lancashire. Here on the right is an example of the wrought produced in Ralph’s own ironworks at Lingfield, Surrey. This functional gate, now over seventy years old looks as good as the day it was installed. The gate itself is one of many that feature in the Hancock Industries brochure. Ralph could offer his discerning customers the full package when it came to selling one of his unique Gardens. From hand built wrought ironwork to antique urns from water features to beautiful garden structures and from rustic to formal. All selected from an extensive catalogue or by visiting his offices at Knightsbridge Green. All images from her visit in May 2018 are kindly reproduced by Joyce Hunt. The location of this delightful garden has now been revealed. It appears that it was built in 1927/28 for the Hulton Family (Hulton Press and Photo Library) in the village of Ferring, Sussex. Built in the grounds of their house 'Lamorna', the garden existed until the house was demolished in the 1960's and the land made-way for a row of beach front bungalows. Local Ferring historian, Ed Miller, visited the site in February 2009 and confirmed the location. Nothing remains of this formal garden although this drawing from the period just before demolition shows where the garden sat in relation to a modern ariel photograph. Simply identified as a garden in 'Chiswick' in 'When I Make a Garden', this lost London garden contains many features familiar to students of Hancock. Tantalisingly, Rod Hancock, a nephew of Ralph's, has two paintings of this garden by the artist Edith Fisher. Neither of the paintings give the location of the garden, but both show details not obvious in the photographs; a sunken formal pool, a rose temple and Ralph's trademark pathways. Chiswick and the 'Dukes Meadows' are a very much different place today than they were in the 1930's. This image could be of a country garden located in Kent or Surrey. This recent discovery was formerly the home of the second Earl Peel, Arthur William Ashton Peel (1901-1969). It is now the home of The Order of the Sisters of the Bernardines and has been renamed Hyning Monastery. From recently found newspaper clippings, dated 31 October 1950, this garden has been rediscovered and confirmed as the last garden designed by Ralph Hancock but, completed by Bramley after his father's death in August 1950. The clippings give details of a court case against the Earl, several builders and Bramley Hancock, who were alleged as to being complicit in an over-spending of £17,000 on renovations to the house, including the garden, for which no licence had been granted. This was contrary to the Defence Regulation. The case against Bramley was dropped and he was discharged. But, the case against the Earl caused questions to be asked in Parliament. These few images show the garden as it is now. They are, without doubt, clearly of Ralph's design. The bridge is remarkably like the one at Twyn-yr-Hydd, Port Talbot. The walls (of the Moon gate) also have a similar appearance. And, the pathways and wrought iron appear identical to those found at nearly all of Ralph's post-war gardens. Far left; the Bridge. And right, and right, Hancock's flagstone paths. Both designs are very similar to designs found at Twyn-yr-Hydd and Derry Gardens. The paths are also the same as those found recently, 2010, in the extensive garden near Canterbury, Kent. Below; Rusty Wrought Iron, including grilles that are almost identical to the ones found at both Derry Gardens and Twyn-yr-Hydd. These were, without a doubt, forged at Mertsham, Surrey, by Hancock and Sons' own resident Blacksmith. 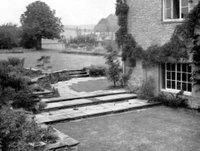 The low Cotswold stone walls and steps can also be found at almost all of the gardens which Ralph, and Bramley designed post-war. They are typical of their work and unmistakeable. Two recently published reports into The Hyning can be found here: The Hyning: Reseach Report and The Hyning: Care and Management Guidelines. In 2010, this house, in Kent, was identified as having an extensive garden designed and built by Ralph Hancock (& Son). The main feature is a rectangular pool with a small crescent moon plus two side pools - each with their own bridge. There was also a fountain, now gone. Other features, within the garden, include a sunken garden, low Cotswold stone walls and steps, that lead into various areas of the garden and from the house. Ralph's herringbone brick pattern, found at the front entrance, a delightful hand forged wrought iron gate, slab pavers, which are used elsewhere, including Derry and Toms. The most intriguing find were a series of large boulders, which are found at the front of the property, lining the drive and are also scattered hap-hasradly. They appear very similar to stone used at Derry and Toms and within his rockery designs (seen at Chelsea). It is possible that they once formed a rockery but may just prove to have been placed in their positions as accents and planted next to specimen plants? The ponds were drained (October 2010), as the current owners discovered a leak. Surprisingly, like the river and court of fountains at Derry and Toms, these ponds are concrete lined. The house was built in 1924 and was the home, until 1981, of Major and Mrs Gracie. Their son confirms that Ralph laid out the ponds and other features in 1947 or 1948. The two images above are an ariel photograph of the garden taken in 1979 and a sketch, by Ralph, showing how the final pond/water feature would look. The sketch is signed by Hancock.